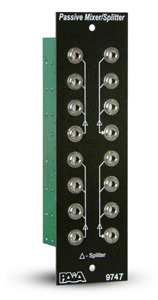 The 9747 Passive Mixer/Splitter is a set of four separate networks (each with four 1/8" TR jacks) on a single-width panel. Each network can be used as a mixer (3 into 1) or a splitter (1 out to 3). The networks can also be wired together for other functions (7-to-1 or 11-to-1 passive mixer or splitter, etc.) and the network resistance can be modified or removed for special purposes. Although the panel is simple, it is very handy for building patches. To purchase the assembled module, click the 9747ASM product page.